The traditional idea of urban public lighting is based on a double approach: on one side, economical savings and technical performances based on quantitative data, on the other side, the creative contribution of lighting practitioners focuses on enhancing urban amenity and strengthening the night-time experience of the city. This dual position is also well represented, on one side, by lighting regulations and public administrations focusing on energetic savings and functional needs [1 – 2]. Conversely, several guides of practice [3 – 4] supported by the lighting design practice5 [6 – 7 – 8] agree that urban lighting is aimed at providing good quality lighting and social experiences. Functional needs, such as visibility at night and security from traffic, have already been extensively investigated with a major focus around car users. On the other hand, this dissertation is an inquiry about good quality urban lighting as primarily intended for people and explores people related visual performances, visual comfort, visual ambiance and social experiences enabled by urban lighting. A small but consistent group of lighting designers is shifting its practice from the architectural to the social and experiential layer of the city. In this regard, a social oriented lighting design has emerged as an interesting approach aimed at providing more accessible and sociable cities but also contributing to a deeper sustainable urban lighting. In comparison to energetic, technical and economic issues, the human, experiential and social values of urban lighting represent a relatively young topic of investigation  which is more difficult to measure or estimate. In addition to this, the available researches around this topic are mainly focused on indoor environments, meanwhile researches in outdoor urban contexts are lacking comprehensive insights and a shared methodology. This lack of deep understanding and need of more investigation is also determined by the recent technological advent of Solid State Lighting (SSL) and digital control systems that is envisioning new possible intelligent applications for urban lighting. This transformation is also including the practice, the design parameters and competences of lighting designers . All these technological improvements can be useful for radically and meaningfully transforming the contemporary cities at night when adding a social value to the urban experience [11 – 12]. In this PhD dissertation, the evaluation of urban luminous experiences from people perspective is hypothesized to be determinant for designing sustainable and social oriented night-time experiences to benefit the social use of the public realm. 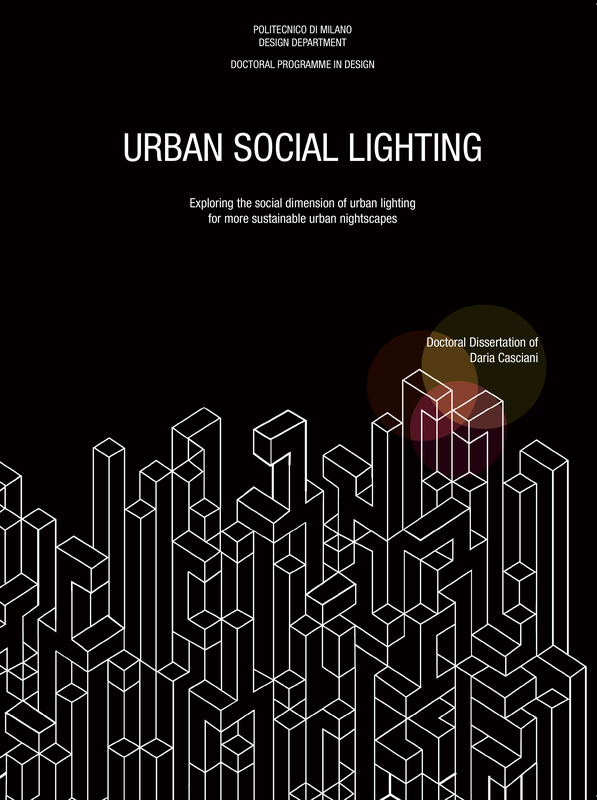 Aiming at defining the phenomena of Urban Social Lighting, the research was based on a multidisciplinary and multiple qualitative and quantitative approach. In order to verify the research hypothesis, both secondary and experimental research were elaborated by analyzing, simulating, designing and testing lighting scenarios and performances toward an in depth understanding of the social and human influence of urban lighting in the SSL era. A first general desk research was performed through the collection, selection and categorization of case studies in order to gather a preliminary descriptive theoretical framework from the lighting design perspective. The second phase was aimed at collecting raw but focused insights about outdoor lighting influence from people point of view: quantitative surveys based on images and videos followed by qualitative analysis were exploited. A third phase was performed as a “unit of environmental experience”  study, by designing lighting scenarios and performances in a real urban context. The exploration was focused on people appraisal with both controlled and uncontrolled behaviours in the natural context: the influence of variables such as lighting colours, lighting spatial distribution and lighting behaviours, both dynamic and re-active, were investigated. As a conclusion, the interpretation and discussion of the insights were presented by comparing the findings of the experiments with the preliminary assumptions derived both from the literature review and case studies research. An overview both from the lighting design practice perspective and from people evaluative point of view was gathered. Findings were focused on further extending knowledge about people spatial experience of lighting from indoor to outdoor applications. In this regard, qualitative insights that could contribute to inform the lighting research field about a more user centred design (UCD) approach in the urban lighting domain were elaborated. The research stressed that, focusing on people, more sustainable lighting scenarios can be implemented: social oriented lighting seems to find a way to conciliate environmental, social and energetic scopes through responsive scenarios that could transform the urban space with an evocative power and, in the same time, re-establishing a trust relationship between inhabitants and the nocturnal city. Certain lighting variables were found to contribute both to social enhancement, luminous positive atmosphere impression and social eco-responsible behaviours. In particular colours of lighting, lighting distribution and lighting proximity were found highly correlated to visual comfort, impressions of a hospitable, accessible and more personalized environment. In addition to this, lighting re-active and interactive performances were found to positively influence the impression of the night both in evocative and entertaining ways, personalizing the space and letting people interact and socialize together. More than this, interactive lighting performances were found to increase people control in defining actively the urban lighting atmosphere. In this regard, this dissertation examined, the different levels of social inclusion through the whole process of urban lighting planning: positive outcomes were found in terms of education and critical responsibility about urban lighting, for building a strong sense of belonging in the definition of the lighting atmosphere, in relation to the evaluation of the project as an ethical commitment of the lighting designer and for a deeper and rediscovered reconciliation of people with the city. More than this, this PhD dissertation reflects on the lighting design practice and on the methodological process for knowledge acquisition when tackling with complex issues about the relationship of lighting, people and city with the advent of new lighting technologies. The role of the lighting designer, its new competences and the trans-disciplinary way of collaborating with different disciplines are discussed. In addition to this, the research provides a complete overview of the methodology and the tools that were elaborated and tested during the research both for designing, collecting and interpreting research results. Due to cultural, contextual, physical and psychological factors that contribute to influence the perception of urban lighting, this dissertation is not conceived as possibly supplying a single and universal recipe for good quality lighting. A conceptual framework and a methodological procedure were provided to be adapted to different urban lighting design and investigation processes. In addition to this, it also envisions future steps in terms of new topics of interest and applications.